As self-organising networks (such as MANETs, sensor networks, P2P) get ‘established’ through the consolidation of efficient routing and information dissemination schemes, an aspiration will emerge, sooner rather than later, to host sophisticated distributed applications on these networks. Such an aspiration will also be underpinned by advances in hardware technology continually rendering devices more capable in terms of information storage, processing and dissemination. Meeting this aspiration however poses several challenges. For example, MANETs are the only viable technology for conducting mobile multi-party collaborations in terrains void of communication infrastructures. Collaborations in their sophisticated form cannot simply be achieved through the use of reliable multicasts alone; support for maintaining shared state (eg., group membership) in a dependably consistent manner becomes essential. Though related problems are comprehensively addressed in wired distributed computing, MANET specific solutions are still in the development stage. Similarly, sensor networking is the only fast and effective way to deep underwater sensing e.g., monitoring the propagation of major oil leaks. However, managing a programmable sensor network comprising several nodes – to a scale typically not encountered in wired distributed computing – will require novel solutions. The aim of this workshop is to provide a forum for researchers to focus on challenges in hosting sophisticated distributed applications in the emerging class of self-organised networks such as MANETs, sensor and P2P networks. The workshop is open to all researchers, system developers and users who are involved with or have an interest in supporting or building applications using self-organised networks. We encourage all the prospective participants to submit an extended abstract, work-in-progress report or position paper. The submissions must conform to the proceedings publication format (IEEE Conference style) and should not exceed six pages, including all text, references, appendices, and figures. They should explain the contribution to the field and the novelty of the work, making clear the current status of the work. Workshop paper submissions should be sent electronically (in PDF format), by the submission date, to Paul.Ezhilchelvan@ncl.ac.uk – the email being titled ‘DASSON Submission’. 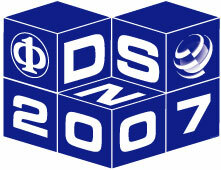 The submissions will be published in a supplemental volume of the DSN Proceedings. François Taïani, Lancaster University, UK.